G.I. Joe The Rise of the Cobra Funko Wacky Wobbler Bobble-Head - Glow in the Dark Storm Shadow! 2009 San Diego Comic-Con Exclusive. Only 480 Produced. Straight from the world of G.I. 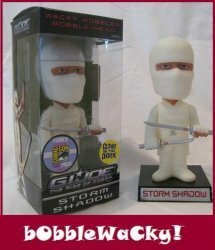 Joe comes Storm Shadow, in the form of a cool limited edition Wacky Wobbler Bobble-Head. This is the exclusive Glow-in-the-Dark version. Only 480 were produced for 2009 San Diego Comic-Con. New in box. Vinyl figure stands about 7" tall. Collect all the Marvel heroes/villians!